Yesterday we heard again about the Nvidia GeForce GTX 1660 (non-Ti) and GTX 1650. Taiwanese industry sources indicated that these new low-to-mid range graphics cards would be arriving on 15th March and 30th April respectively. Recommended retail pricing is expected to be US$229 for the GTX 1660 and US$179 for the GTX 1650. With these prices it looks like the whole GTX 16 line is priced up a notch higher than it should be - but launch prices always feed off as much initial enthusiasm that they can - before they eventually simmer down. AMD portfolio pricing reaction will make a difference too, when and if it happens. Today we have some additional Nvidia GeForce GTX 1650 from the Twitterverse. It isn't from any old anonymous source through, the pair of Tweets forming the foundation to this article come from Andreas Schilling, the editor of the Germany-based tech site Hardwareluxx. 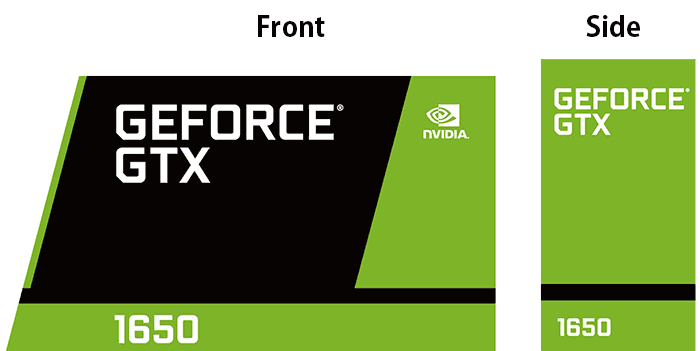 Schilling has shared the images, above and below, which will have formed an artwork pack sent to Nvidia partners so they can be officially on-brand with their product packaging. Such packs usually contain the images and any artwork creation rules concerning proximity of other artwork, rules regarding colour, and regarding graphic effects and so on. Basically designers must not squash, make partly transparent, change colours of, or put other images over these elements. There will sometimes be extra files for use in monochrome artwork. The large elements you see look like they are intended to brand the lower right front and side(s) of the graphics card box. Lastly, directly above, there is a textual banner for other locations. Probably the more important Tweet from Schilling is the 'confirmation' that the GeForce GTX 1650 will use 4GB of GDDR5. We had reported this previously but the more independent sources that confirm it the better. So far the only GTX 16 series card we officially know of is the GeForce GTX 1660 Ti, and of course that comes with 6GB of GDDR6. Reports suggest that Nvidia will be producing a 3GB variant of this card and that the GTX 1660 will similarly become available in 3GB/6GB configurations - but using GDDR5. Checking the calendar, it is little over a fortnight away until we will see the official launch of the GTX 1660 but it is two full months before the launch of the subject of today's article, the GTX 1650. I'm sure we will see further leaks and information about both these unreleased cards in the intervening time.